Love the fresh flowers of springtime? Bring them inside by ordering a spring flower arrangement from BLOOMING BALLOONS & BUDS, your local Shelbyville flower shop. You will love gazing at your beautiful blooms all week long. Know someone who needs a little appreciation? Send spring flowers to lift their spirits, no matter if they live next door or across the country, BLOOMING BALLOONS & BUDS can help! BLOOMING BALLOONS & BUDS creates a sunny sensation with vibrant summer flowers. Select a sizzling summer flower arrangement to add pizazz to your home or office. Send a ray of sunshine with a floral bouquet of summer flowers. Add a punch of tropical colors to your summer fun with a glorious flower arrangement. Celebrate the carefree days of summer with a crescendo of garden delights arranged impeccably in a vase. From the first bang of the season to the end of Indian summer, BLOOMING BALLOONS & BUDS creates a spectacular parade of colorful flower arrangements. Fun, festive and irresistible; the sheer pleasure of summer flowers awaits you in Shelbyville. 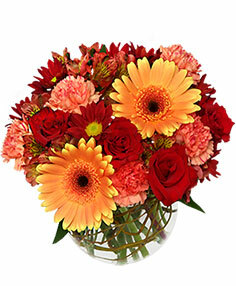 BLOOMING BALLOONS & BUDS captures the essence of the autumn harvest with their colorful fall flower arrangements. Radiant reds, rustic browns, and golden yellows are all perfect for this season. Having a party or get-together? Nothing adds more to a room than a festive fall arrangement. It's the perfect coversation starter! Whether you want to send as a gift or keep for yourself, BLOOMING BALLOONS & BUDS can help with any type of fall flower arrangement! Winter is a season of powdery-white snow, fresh cedar and pine, mistletoe and more. This heavy season's beauty is best adored indoors. BLOOMING BALLOONS & BUDS can help you order a festive arrangement of winter flowers for yourself or a deserving friend. Reds, greens, whites, golds -- all brighten even the chilliest of spaces. Winter parties are so much better with the color of winter blooms! So remember the helpful staff at BLOOMING BALLOONS & BUDS for your flowers this winter.